Washakie Museum of Worland – Annie Get Your Gun & Mammoth Quick Draw Coming Up! The life-size bronze Columbian Mammoth stands guard outside the Washakie Museum and Cultural Center, enticing passers-by with its magnitude. Casper sculptor Chris Navarro created the mammoth that makes such a powerful first impression for travelers, but what is inside the museum keeps visitors there for hours. The Washakie Museum and Cultural Center in Worland, Wyoming, serves the Big Horn Basin as a history museum and an art and cultural center, as well as the local Visitor Center. The present 25,000 square foot facility opened in 2010 and houses two permanent exhibits: the Ancient Basin and the Last West, as well as a constantly changing temporary gallery. Dinosaurs, mammoths, rifles and a sheep wagon are only a fraction of the exhibits, many of which are interactive. The museum also holds lectures, book signings, community theater, formal dinners, live musical performances, children’s programs and art shows. Washakie Museum is a registered non-profit entity, operating on donations, membership fees, patron support, grants and fundraising efforts. One of the most important fundraising events occurs in November: the annual Mammoth Quick Draw. Hosted in partnership with the Worland Rotary Club, the Quick Draw is now in its fourth year. Both groups utilize the funds to improve facilities and opportunities in Wyoming and beyond. The Worland Rotary Club is heavily involved in funding both local and international projects including a cabin at the H Diamond 4H Camp, fitness equipment to improve Riverside Park, playground equipment for the Children’s Resource Center, and partnering with the Evanston Rotary to fund a latrine project in Guatemala. The Rotary Club in Worland also hosts and greatly assists in funding International Exchange Students. The Washakie Museum benefits from the work the artists create in the Quick Draw, and in return supports Wyoming artists through holding shows, sales and art education workshops. Mark McKenna, Robert Martinez, Ray Bower Jr., Linda Sopko, Gayle Barnett, Belinda Daugherty, Sam Angelo, Jim Davis, and Linda Jolley are some of the Quick Draw artists who return to the museum to exhibit their work and lead artist workshops for the community. The Quick Draw is an important fundraiser for both groups, but above all, it is an entertaining evening with music, food, and incredible art. The 2015 Mammoth Quick Draw will be held November 20 from 5:30-10:00 PM at the Washakie Museum with tickets for $40. Executive Director Cheryl Reichelt says, “I hate to call it a party, but really, it is a fun event for everyone.” The evening begins at 5:30 PM with a gourmet meal by Chef Katy Hayes and live music by the Wyoming Fiddlers’ Association. Guests can eat and are encouraged to mingle with the artists who are set up throughout the building. Sam Angelo, a skilled wood turner out of Worland, humorously claims, “The Quick Draw turns an otherwise solitary and introspective behavior into a vaudeville act.” Angelo certainly plays to that aspect of the evening, setting up a camera and screen for his fans to better see the detail work he does. The audience of over 400 enjoys interacting with the artists—whether or not the artists are ready. Attendees also have the chance to examine and purchase additional works on display by each artist, and the “wall art” becomes part of the excitement. The Artists’ Quick Draw begins at 6:30 PM and lasts exactly one hour. Artists have the option of either a Quick Draw or a Quick Finish. In a traditional Quick Draw, the artist creates and finishes an entire piece during the hour, while in a Quick Finish the artist finishes a piece previously started. Watching the professional at work is an unusual opportunity for art lovers, and intoxicating part of the evening. Christine Dubbs, painter from Bozeman, Montana remarks, “It is a unique experience that allows artists to share part of the creative process with the public. I would like to think it offers an interesting perspective that the typical art viewer never gets to explore.” Guests are encouraged to observe that process, and many fan favorites are developed during this time. At precisely 7:30 PM, the completed works go up for display in preparation for the final event of the evening–the live auction. The auction is conducted by Ed Keller, a local auctioneer who continues to donate his time every year for the event. Emcees for the evening are Mike Greear, Rotary member and state representative for Wyoming House District 27, and Martha Lawley, current Vice-President of the Washakie Museum’s Board of Directors, and are sure to entertain throughout the auction with their amusing banter with the crowd and artists. Any unsold art work remains on display through the end of the year, giving those who missed the event a chance to see and purchase the work by these skilled professionals. The art is the real reason for the evening, and the art from the Mammoth Quick Draw is some of the finest in Northern Wyoming. Thirty artists are expected this year. The artists come from Wyoming, Montana and Northern Colorado. Most of the artists are returning favorites, often requested by patrons. Currently, Worland artists attending are Sam Angelo (woodturning), Tracy Myers (pyrography), Pam Greek (Raku), Jessica Salzman (beadwork), Cheri Shelp (textile weaving), Victoria Frisbee (printmaking), Brenda Suko (drawing), Kent Richins (oil painting), Darlene Hill (oil painting), and Victoria Bales (oil painting). Other returning artists include Steve Lillegard (Stanford, MT), Gail Patrick (mixed media, Manderson), Dustin Stephenson (pottery, Ten Sleep), Karyne Dunbar (mixed media, Shell), Belinda Daugherty (watercolor, Ten Sleep), Suzi Richards (acrylic, Basin), Gayle Barnett (watercolor, Meeteetse), Christine Dubbs (watercolor, Bozeman, MT), Robert Martinez (airbrush, Riverton), Linda Jolley (acrylic on slate, Greybull), Glenda Ramsey (watercolor, Thermopolis), and Mark McKenna (oil painting, Powell). Artists making their debut in the Quick Draw this year are Jim Hagstrom of Cody (painting), Tawni Shuler (mixed media) and CR Sadler (painting) both of Sheridan, and David Henderson of Basin (painting), Angela Siems of Thermopolis (painting and pastels), and Diana Dellos of Fort Collins (painting). While the Mammoth Quick Draw is an important fundraising evening at the museum, it is only one of many historical and cultural events that take place this fall. Bill Sniffin arrived to sign books and lecture on Tuesday, September 15. Gayle Barnett, Meeteetse watercolor artist, opened her show the evening of October 2 with a Friday Night Wine Down and an artist workshop on October 3. Barnett’s show runs through October 31. “Seasons of Needlework,” a collaborative exhibit by Cross-Stitchers Anonymous and the Cottonwood Quilters, arrives for an opening on October 15, and the exhibit remains up through November 14. David Romvedt, a former Wyoming Poet Laureate, current instructor in the MFA writing program at UW, and accordion of music group The Fireants, celebrates his new novel on October 17 with a reading and performance of traditional Basque music. Annie Get Your Gun is a community theater performance directed by museum performing arts staff on October 23-24 and will be performed at the Worland Middle School auditorium. The 2015 Mammoth Quick Draw is November 20 and starts at 5:30 with tickets for $40. Tickets can be purchased on the Washakie Museum & Cultural Center website or Facebook page, at the museum, or through a local Rotary member. General Admission to the museum is $8 for adults, $7 seniors, $6 children 7-12, free to children 6 and under, and a family rate of $25. 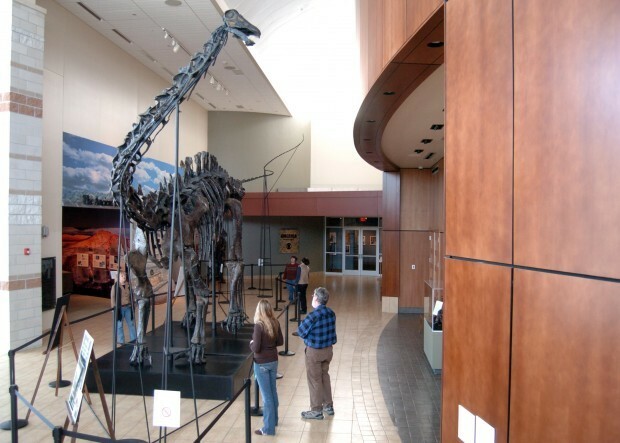 Washakie Museum is an AAA Listed Attraction with a discount on general admission for AAA members. Winter hours are Tuesday-Saturday, 9:00 AM-4:00 PM. The museum is located at 2200 Big Horn Avenue in Worland. Find out more about the Washakie Museum and Cultural Center, including upcoming events, at www.washakiemuseum.org or on the Facebook page www.facebook.com/washakiemuseum.